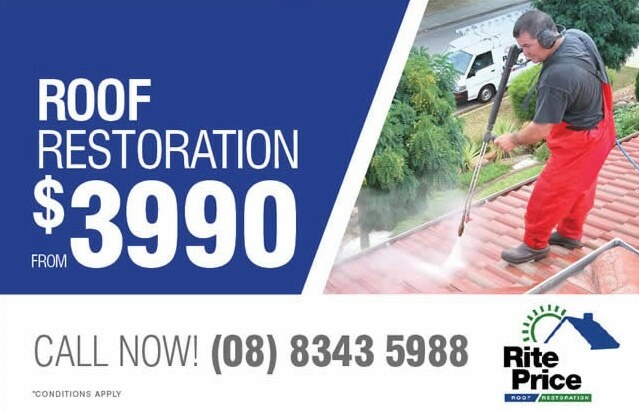 Welcome to Rite Price Roofing, where Adelaide’s top roofing experts are ready and willing to help you with any roofing and roof restoration project. Rite Price Roofing is a family-owned, proudly South Australian business with a 20-year history of excellent service. We offer a whole range of roof restoration products and services to help you with your renovation project. Our services range from the basic roof cleaning to keep your roof sparkling all the way up to a full roof replacement for treating extensive issues. We also offer partial roof restoration, where we repair or replace chipped or damaged tiles and examine flues and flashing for signs of a problem. If we find any leaks or damage, we can use a flexible sealant to quickly get your flashing back in working condition. Our roof cleaning process is a simple high pressure wash that removes all of the lichen, old paint, moss, and dirt that may be adhering to your roof. This is a 100% water wash no harsh chemicals are involved so your roof looks beautiful and keeps its integrity. Mould growing in your roof? As part of the roof restoration process, we can handle repairs for mould, too. Our expert team of roofing professionals can remove it with a mould-killing solution, without damaging your roof. Sometimes, though, a roof is too damaged or decayed for a restoration to be possible. In these cases, we’ll replace your old roof with a brand new tile or metal roof. With a brand new roof from Rite Price, you’ll have peace of mind knowing your home can stand up to any weather conditions. We guarantee all of our workmanship for 15 years, and we paint our tile roofs with a reflective paint membrane that comes with a 15-year warranty against cracking, warping, chipping, and peeling. We also guarantee our metal roofs for an unparalleled 25 years and that warranty even covers leaks. Plus, our platinum guarantee covers all workmanship for 25 years when you choose a metal roof from the Fielders range of products. When it comes to protecting your home, though, the roof isn’t the only component you need to be worried about. Your gutters are critical structures that often go overlooked but without well-maintained gutters, your home is susceptible to damage. Gutters protect your home from water damage and flooding, keeping your foundation in top shape. If you don’t regularly maintain your gutters, the build-up of rain, snow, leaves, and debris can create a perfect breeding ground for mouldwhich can block or even rot your gutters. Your gutters can also pull away from your home over time, which means they won’t be able to funnel water away from your roof. Rite Price can maintain, repair, or replace your gutters to keep your roof in prime condition. Contact us today for a very reasonable roof restoration quote. Traditional roofing colors plus popular Tile and Metal roofing colors – all with Dulux durability. Talk to your Dulux AcraTex Roofing Professional about colors you don’t see here. InfraCOOL technology Optional across most colors in the range. Colors marked (the infraCOOL star), are available in Cool Roof with InfraCool Technology to reflect more of the sun radiation. InfraCOOL works by targeting the Suns infrared rays which account for approx. 50% of the Suns Total light energy hitting the roof. By reflecting more light, InfraCool helps keep surfaces cooler and reduce heat buildup. Here at Rite Price Roofing Adelaide, we use only the best materials on the market from known brands that you can trust. Our Delux roof coatings are quality Australian-made coats that that protect your roof from the elements. 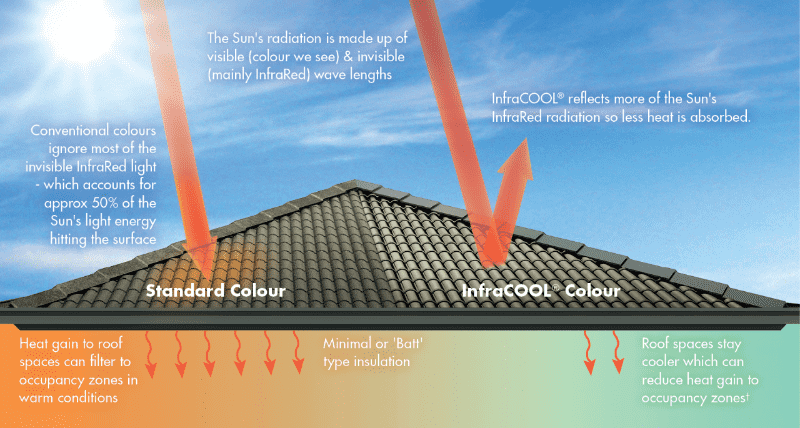 Products like the Roofcote Supa Cool can reflect heat away from your home, while primers like Roof Clean and Mould Rid keep your roof in top shape. Delux is a proudly South Australian paint maker here in Adelaide, and they have years of experience in creating the best water-based coatings on the market. Delux’s roof membranes, primers, and cleaning products can keep your roof looking great while also treating problems like rust. We’re pleased to be partnering with another leader in the business to offer you fantastic paint options for your roofing needs. With the best Delux products protecting your home, your roof will last for years. Our Fielders range of products for patios, carports and verandahs give you a huge range of colours, finishes, supports, and designs to choose from. You can opt for a traditional heritage-style patio or a contemporary premium pavilion, or any number of other styles that will add character to your home. Fielders is another local South Australian business that, since 1900, has manufactured roll-formed steel roofing for home and industrial use. Fielders is known for its new FreeForm roofing material that can bend into shapes and curves, making it easy to create a unique roofing design you’ll love. Fielders has years of expertise in producing roof material with aluminium and galvanized finishes, and they also offer a whole range of Colorbond products. Our partnership with Fielders means you can access their whole range of products and benefit from a 25-year guarantee. Whether it’s a set of gutters, vents, or metal roofing, there’s a Fielders product for you. No matter what kind of treatment your roof may require, here at Rite Price, our expert team are ready and able to serve. Our team has over 25 years of experience in the roofing industry, which means we’ve seen it all. Chipped tiles? Mould growing in a corner of the roof? We can spot-treat small issues and handle repairs quickly without breaking your budget. A roof repair can prevent further damage and keep animals and birds out of your attic. These small repairs typically involve replacing broken tiles and securing loose flashing. When it comes to small roof issues, you’ll want to ensure you address any problems promptly before they snowball into larger problems that require more expensive repairs. Ignoring a small leak or hole could mean you lose energy efficiency or allow your roof to deteriorate further, while a clogged or loose gutter is a safety hazard that could fall or overflow onto your roof causing water damage. You should inspect your roof for damage once per season to stay on top of potential problems. If you see any warping, loose gutters, or any cracked, loose or missing tiles, you’ll want to treat these issues immediately. For more extensive issues like mould, or any kind of roofing treatment you don’t feel comfortable doing on your own, you’ll want to call a professional roofing company like Rite Price. We can open up your roof and perform a deep clean and then replace a portion of your roof with matching materials. These roof restorations can put a worn, aged roof back in decent shape. If you notice that your roof leaks, or if you find any interior damage whatsoever, you’ll want to call a roofing company. This is particularly true for homes with flat roofs, as a flat roof is easily damaged by water. Leaks and interior damage are signs of serious issues that are best handled by a qualified tradesperson. A loose chimney and other exterior problems should also be left to the professionals. Most roofing problems can typically be resolved using some kind of repair method. Sometimes, though, an issue is so extensive that the only solution is a complete roof replacement. If your roof is falling apart due to weather damage, widespread mould, or age, it may be necessary to completely replace the entire outer layer and possibly the inner layer as well. A roof replacement is an extensive process that can take several weeks to complete if you try to do it yourself. An experienced roofing contractor, though, can finish the job in 3 to 4 days. Roof restoration is a multi-step process that ends with a fully restored roof you can count on. But how exactly does this process work? What can you expect during the roof restoration process? First, you’ll receive a free inspection courtesy of the experts at Rite Price Roofing. During this inspection, one of our roofing professionals will look at every part of your roof and identify broken tiles, loose components, and wear & tear. The inspection will also include examining flues and flashing for leaks or other problems. Next, our team will professionally clean your roof using a delicate pressure washer that blasts away dirt, moss, and debris without harming your home. This gentle wash is completely natural and doesn’t involve any added chemicals just pure, clean water. Our team will re-point the ridge caps on your home and ensure they are watertight. We’ll perform one final cleaning and inspection for dirt and debris before moving on to the second stage of the restoration. If you choose a metal roof restoration, the first step in the process will still involve cleaning the roof. The metal sheets will be power washed and cleaned with an anti-rust agent, then primed with a metal primer. The first pieces to be installed will be the flashing around the perimeter of the roof. They’ll be secured with nails and will overlap the gutters. Next, your roofing professional will install the metal panels, working from the longest peak to the eave point. The panels will be installed using washer head screw and will overlap about an inch. The process may involve applying a silicone sealant. The final pieces to be installed will be the joint flashing. The final inspection will involve checking that all edges are smooth and finished and that there are no loose pieces. If you prefer terra cotta or concrete tiles, a tile roof restoration will follow the same general process as a metal roof restoration, with a few key differences. First, a contractor will replace all of your cracked and broken tiles. Next, the contractor will pressure wash the roof to rid it of mould, lichen, and dirt. Your roofing professional will remove the ridge caps and re-bed them, if necessary this involves removing the ridge caps, laying a new concrete bed, and re-laying the caps to create a straight line. Then the ridge caps will be re-pointed with pointing mortar. The next step will be to apply a primer coat or sealant to the roof this will ensure that the tiles adhere to the roof by providing them with a coat of gripped material. Afterward, we’ll apply a set of acrylic membrane coats (usually two coats, but sometimes more) in the colour of your choice. These heavy coats create a protective layer over your tiles and improve your roof’s appearance. The final step will be the inspection, where we inspect the roof for quality of workmanship and address any issues our team may have missed. A professional roof restoration performed by experienced tradesmen will save you time, money, labour, and grief, and will benefit your home in several ways. Firstly, a professional roof restoration will seal any gaps or holes in your roof which will prevent rain and animals from getting in and causing damage to the interior of your home. Secondly, a professional roof restoration will make your roof look like new. This can mean a boost to your home’s curb appeal which is great if you’re looking to sell in the near future and newfound pride as a homeowner. Thirdly, a roof restoration will remedy any structural issues with your roof that may be causing problems. It’s only a matter of time before structural issues can cause your roof to fail, which could pose a serious danger to your family. With a professional roof restoration, you can have peace of mind that your roof is up to the challenge of protecting your home and your family from the elements. Finally, a roof restoration will improve your home’s energy efficiency. Your roof is meant to protect your home. A roof with leaks, drafts, gaps, and other deformities will have trouble serving its purpose. A defective roof will allow hot air to escape in the winter and cold air to escape in the summer, which means you’ll see an increase in your heating and cooling bills. When you’ve had your roof restored, though, you’ll seal your home and protect it against energy losses. If your roof is in need of repair, restoration or replacement, you’ll want to contact an experienced roofing team and you’ll want to do it sooner rather than later. Your roof is a critical structure that protects the rest of your home, and without a properly maintained roof you’re leaving your home susceptible to leaks, pests, drafts, and damage. A professional roofing company like Rite Price can clean your roof of dirt, debris and mould, without using harmful chemicals. We can also repair chipped, cracked or broken tiles, warped metal, and interior problems all within just a few days. At Rite Price, we stand behind our workmanship and our suppliers and that’s why we guarantee our products and labour for up to 25 years from the date of installation. If you’re tired of unscrupulous contractors who use half-rate materials and improper techniques, we can help. All of our industry experts have decades of experience installing gutters, tiles, flashings, metal sheets, and more. We’ve also partnered with the best vendors in South Australia including Fielders and Delux to bring you premium, effective materials at an affordable rate. We’re proud to offer the highest quality materials on the market from local businesses you know and love. We have the widest product selection of any roofing company in the area, so you’ll have no trouble finding the roofing solution that works for you. Our friendly staff are happy to give you sound practical advice on your roofing project, no matter how large or small it is. We’re committed to providing the best service in the industry, which is why we offer a preliminary in-home consultation and quote FREE of charge. Here at Rite Price, we specialize in providing roofing solutions for hard-to-access areas and we can provide a custom roofing solution for you, whether your roof is of an unusual design, you have a two storey home, or there are unique environmental factors that need to be considered. But we don’t just handle roofing and guttering for your house. We also have a whole selection of roofing solutions for your carport or verandah, with a range of design and colour options as unique and creative as your home. That means you can build the add-on you’ve always dreamt of in the exact style you want. Forget the DIY approach and forget dealing with shady contractors who show up late, use sub-par materials, and cut corners. A proper roof restoration shouldn’t cost a fortune, and it shouldn’t mean having to chase and harass your contractor night and day. At Rite Price, we put you first and we have a 25-year history of excellent service. If you’re ready to discover the Rite Price advantage, our team can help you to plan your roof restoration and ensure it lasts. With a trustworthy roofing company on your side, no repair is too large and no challenge is too great. Call Rite Price Roofing at (08) 8261 3941 today to get your free roof restoration quote and discover why we’re South Australia’s most trusted roof restoration experts.